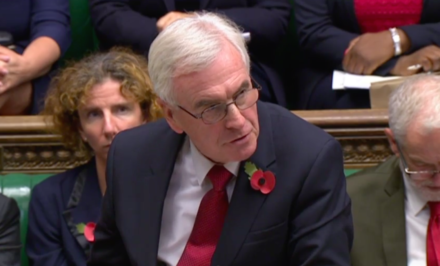 Below is the full response of John McDonnell, Shadow Chancellor, to the government’s Autumn Budget 2018. Four weeks ago the Prime Minister promised to end austerity. She raised people’s hopes. She raised the hopes of teachers that they’d no longer have to rely on begging letters to parents to fund the running of their schools. She raised the hopes of police officers that the safer neighbourhood teams would return to tackle the scourge of the rise in violent crime. She raised the hopes of local councillors that they would have the resources to support local families in need at a time when a record number of children have been taken into care. Those hopes were dashed. At best, they got what the Chancellor described as ‘little extras’. No wonder there are so many teachers, police officers, local councillors who feel bitterly disappointed at the Prime Minister’s broken promise. Because yesterday’s budget was not the end of austerity. Even with yesterday’s Budget, two thirds of the planned welfare benefit cuts will still be rolled out. Outside of the NHS, departmental budgets are flat. And the Resolution Foundation this morning revealed that some departments face a further 3% cut in their budgets by 2023. For most people, ending austerity isn’t just about halting some of the cuts planned by the Government. It’s about lifting the burden that austerity has imposed upon them and their community. It’s about repairing some of the damage that’s been inflicted on our society. That has undermined our social fabric. Yesterday, the chancellor claimed that this is a turning point. It is a turning point – but not in the way he suggested. This isn’t the end of austerity. But it is the beginning of the end of the dominance of an economic theory and practice that has wreaked havoc in our communities. People no longer believe the myth that austerity was necessary. Because they’re seeing this Government hand out 110 billion pound tax giveaways to the rich and corporations while their services are being cut. They no longer accept the trickle-down economics that has gripped the Tory party for four decades. That somehow, if you cut taxes for the rich and for corporations, this wealth will trickle down to everybody. They no longer accept public sector bad – private sector good. Privatisation and deregulation are anathema to them now. What was surprising yesterday was how lacking in self-awareness the Chancellor and his colleagues are. How out of touch they are with the reality of the day to day lives of our people. The Chancellor’s speech reflected how ideologically crushed the Tories now are. So bereft of ideas that the Chancellor is reduced to toilet gags in a major Parliamentary speech. So bereft of ideas that that they make a pathetic attempt to imitate some of Labour policies. For some time I’ve had real concerns about the nature of the whole debate on austerity. First, many, but I accept not all, of the Party opposite seem to have no appreciation of what austerity has meant and continues to mean for so many in our society. I thought at one point it was because many Labour MPs like me represent constituencies with a different demographic to many Conservatives. My community is a working class, multi-cultural, London constituency. And yes, it’s faced with different challenges to leafy Surrey, for example. But most of all our constituents still rely on the NHS, local schools, the police and local Council services. So all of us should have some idea of what the public services that support our constituents have been going through. And what shocked me yesterday was the Chancellor delivered a budget that so clearly failed to address the desperate needs of our society, the result of eight years of hard austerity. Let’s just look at some elements of the human cost of austerity and what the Chancellor brought forward in the Budget. If you are a health worker you are having to cope with the biggest financial squeeze in the NHS’s history. The IFS have said that a rise in health spending of 3.3% was needed just to maintain the current stretched service, and at least 4% to improve that. Instead we got what amounts, according to the Nuffield Trust, to just 2.7% in real terms next year. If you are a Police Officer you will have seen over 21,000 of your colleagues’ jobs cut since 2010. As a result violent crime is on the rise. And the independent police watchdog are warning that “the lives of vulnerable people could be at risk.” And what did we get yesterday? £160 million for counter-terrorism (far less than what is needed) and not a penny more for neighbourhood policing. And this, despite the Head of Counter Terrorism warning that their work relies on properly funding regular policing. If you are a Teacher, your pay has fallen by £4000 since 2011 and the schools budget has been cut by £3 billion in real terms. 36,000 teachers left the profession last year, the highest level since records began. What did yesterday’s budget do to tempt them back? Not a “little extra” but a big insult, especially when 60% of teachers aren’t getting a pay rise this year. There are now over four million children living in poverty. Over 500 children’s centres and 500 children’s playgrounds have been closed. There are 128,000 children living in temporary accommodation. When children’s social care face a funding gap of £3 billion by 2025, the £84 million offered to just twenty councils is not going to scratch the surface of the problem. For young people, the YMCA reports that spending on youth services has fallen 62% since 2010. The average graduate coming out of university has a £50,000 debt. The IFS describes home ownership amongst young people having collapsed. Tragically with mounting pressure, a decade’s long decline in suicides amongst men has reversed since 2010. To make a real difference to the lives of young people the Chancellor needed to address the housing crisis, deal with the toppling mountain of student loans and restore work allowances for single people and couples without children. Instead we got piecemeal unambitious housing announcements and re-announcements, nothing on student finances, and nothing for Universal Credit recipients who are single and without children. For older people, there were over 31,000 excess winter deaths among the over 65s in 2017. Well over 150,000 elderly people are in arrears on their social care payments. £1.5 billion was needed for 2020 just to fill the funding gap in adult social care. The £650m announced yesterday is less than half of that. The burden of austerity has fallen disproportionately on the shoulders of women. Yesterday that didn’t just continue, it got worse, with the share of the Government’s tax and benefit changes impacting on women increasing from 86 to 87%. And the 1950s women, who have been treated so unjustly, looked over once again. The victims of possibly the harshest cruelty inflicted by this government have been disabled people. A UN inquiry into the rights of Persons with disabilities has found this government guilty of the “grave and systematic violations” of their rights. Many have taken their own lives as a result of the welfare reforms imposed upon them since 2010. The Government have been repeatedly forced by the courts to change how they are treating disabled people. Have they finally learnt their lesson? No. Yesterday, we saw no restoration of disability premiums, no end to the cruel social security freeze, and no end to dehumanising and unreliable Work Capability Assessments. The Government is also putting the livelihoods of future generations at risk. A few weeks ago the world’s leading authority on climate change said the avoiding dangerous climate change would require “rapid, far-reaching and unprecedented” action. What did we get yesterday? No mention of climate change, no reversal of cuts to renewable energy, no significant environmental policy. The impact on the self-employed and small businesses has been equally stark. 51,000 high street stores closed last year. Wages for the self-employed have collapsed and are now around the same level as they were 20 years ago. Yesterday we needed serious action to address the bias against High Streets which have led to so many empty shops. Instead we got legislation which will help turn shops into flats. My second concern about the austerity debate is: if you understand and appreciate what people have been forced to go through with austerity, only callous complacency would drive you to inflict those policies on people. Yesterday the Chancellor’s speech – with references to Labour’s recession – demonstrated just how he’s trapped in a time warp of a political propaganda exercise by the Tories of a decade ago. Let’s be clear: the financial crash was the result of greed and speculation and lack of regulation that goes right back to the 1980s. Austerity was always a bad idea. The consensus amongst economists, and the evidence of recent history, is now absolutely clear. The worst possible response to a recession is for a government to cut its own spending. In a recession, the government should be there to support businesses and households. Instead, at the moment government support was needed most to help people back on their feet, Conservative Chancellors chose to impose the most severe spending cuts in generations. They’d didn’t have to, and they shouldn’t have done. The Tories were warned austerity would lead to slower growth and lower wages, and it has. The economic experts that the Tories chose to ignore were proved right. Growth since the financial crisis, under Conservative Chancellors, has been the slowest from any recession in modern times. Real weekly average earnings today are still lower than they were in 2010. The Resolution Foundation reports this morning that real wages will not have recovered fully until 2024. Ten years after the crash, we should be clear about the causes of the financial crisis. The Chancellor seemed very confused on this point yesterday. It wasn’t the deficit that caused the crisis, but the crisis that caused the deficit. It was a crisis that resulted from the casino economy that the Tories helped construct, right from the 1980s, and supported every step of the way. It was their ideology of neoliberalism that said markets were always right, that regulation was simply a barrier to growth and that, ultimately, greed was good. The financial system this ideology helped design collapsed ten years ago, and it was Conservative Chancellors who took the political decision to force working people – not the financiers – to pay the price for it. This result has been a period of stagnation unprecedented in modern British history – a period of falling wages, crumbling public services, insecurity in an economy visibly failing across great swathes of the country. And because the cuts are still, even now, grinding on, the stagnation will continue, as the official forecasts say. Investment forecasts have been revised downwards across the OBR’s forecast period. Real wages will barely recover. Growth will remain far below its long-run trend. The Chancellor can’t use Brexit as an excuse for these dismal figures. The OBR presented its forecasts on the basis of what it called a “relatively smooth exit” from the EU next year. But the Tories’ bungling of the Brexit negotiations has been so bad that the economy has been impacted upon right now. Investment is being delayed and even cancelled. Britain already has the lowest rate of business investment in the G7, and even that has fallen this year. It’s the uncertainty the Tories have introduced into the whole process that is so terrifying business people. They just want to know where they stand. But that uncertainty was even worsened yesterday morning. The Chancellor has taken to threatening to revoke his own Budget in the event of a no deal Brexit. Yet on the very morning of his Budget, his own Prime Minister was contradicting him. How can any company, looking to invest in Britain, not look at this and wonder where we are headed? In well over two years, the Government has spent more time negotiating with itself than our European partners. With the date of leaving the EU just five months away, time is running out to present a deal that would respect the result of the referendum and could win the support of the House, as the Rt Hon Member for Islington North has offered. Instead, as the Tories continue to indulge in their squabbling, the economy and the whole country are being confronted with the grim prospect of a no deal car crash. I’ve asked the Chancellor before to rule out a no deal Brexit. A responsible Chancellor simply wouldn’t support this, and wouldn’t – as he has done before – idly threaten to mutate this country into some tax haven off the coast of Europe. Mr Speaker, let’s put on the record: austerity is not ending. In the weeks and months ahead, people will recognise that the Prime Minister’s promise has been broken. There are rumours that this was possibly a pre-election budget with pre-election tax giveaways. If the Conservatives are contemplating a general election let me say, on behalf of the Labour Party, bring it on.